The Lufthansa Senator Lounge A50 at Frankfurt Airport could best be described as "better than business class but not quite first class", given business class passengers have no access here unless also holding the right frequent flyer card, yet the airline's own first class flyers have access to a separate lounge that's a cut above. Interestingly, a Star Alliance Gold frequent flyer booked in economy class can visit this Senator Lounge, whereas a full-fare business class passenger without status cannot – an interesting approach, given that for most other airlines, the reverse would be true. Located in the part of Frankfurt Airport that primarily caters to German domestic and European flights, here's what's on offer at Senator Lounge A50 if your boarding pass or frequent flyer card gets you inside. As its name suggests, you'll find this Lufthansa Senator Lounge near gate A50 at Frankfurt Airport, not far beyond the main security screening check. For those unfamiliar with Lufthansa's airport lounge hierarchy, Senator Lounges are mid-tier facilities, sitting one rung above the Lufthansa Business Lounges, but a rank below the First Class Lounges. This location is open from 5am until 10pm daily. 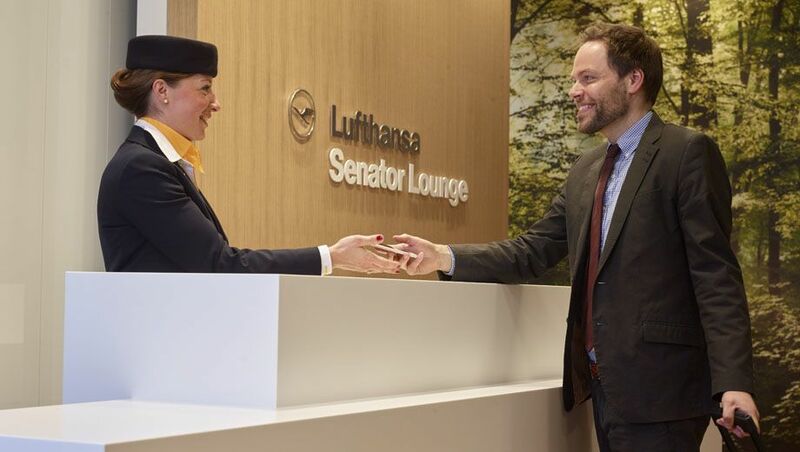 With 14 lounges across Frankfurt Airport alone, this particular Lufthansa Senator Lounge is accessible to guests travelling within the Schengen Area, including both German domestic flights and those to other European countries such as France, Italy, Spain and Switzerland. Star Alliance first class passengers departing on a same-day flight. Miles & More Senator frequent flyers departing on or arriving from a Lufthansa, Star Alliance or eligible codeshare partner flight the same day. Star Alliance Gold cardholders departing on a same-day Lufthansa or Star Alliance flight. While Miles & More HON Circle members can also access Senator Lounges, in Frankfurt, these top-tier travellers can instead relax in the Lufthansa First Class Lounge in the same terminal before or after an eligible flight, as can passengers with a same-day Lufthansa or SWISS first class flight. Business class passengers of Lufthansa and other Star Alliance airlines have no access here, unless also holding a Star Alliance Gold frequent flyer card. Without one, a business class boarding pass provides access only to Frankfurt's Lufthansa Business Lounges. Given I was travelling from Germany to Italy, it seemed appropriate to enjoy a German pretzel together with a glass of the (Italian) Prosecco, albeit in a regular wine glass as flutes weren't available. That said, aside from a slightly larger selection of spirits, the food and beverage offering here is almost identical to the lower-tier Lufthansa Business Lounge in the same terminal, which I also visited that morning. ... while tests of the lounge's complimentary WiFi network showed average download speeds of 19Mbps and uploads of 34Mbps, which is more than acceptable. An absence of boarding calls here also keeps any interruptions to a minimum, keeping you on task. If you've arrived early with time to spare or just want to kick back before heading to the gate, there's no shortage of comfy seats here – whether you take a day bed over in the lounge's rainforest corner, or one of the many leather chairs throughout the lounge. Flights departing from other concourses appear here too, useful for passengers who may have swung by this lounge before continuing with their journey, but if you are departing from another section of Frankfurt Airport – such as the B gates, which require you to clear outbound passport control first, be sure to allow plenty of time for that. Overall, this lounge is a real mix, catering to both Star Alliance first class passengers and Star Alliance Gold frequent flyers travelling in economy, or in business class, because a business class ticket alone won't get you in here. As such, this isn't a true first class lounge – and, to be fair, it doesn't pretend to be, given Lufthansa and SWISS first class flyers use a different lounge – but as far as lounges go for elite frequent flyers in Europe, this is one of the better ones, especially when there's work to be done before your flight. Chris Chamberlin travelled to Frankfurt as a guest of Star Alliance and Lufthansa. Fair summary. There's also usually a stand putting together little sandwiches and salads to order, to the right of the main bar. The Senator lounge in the non-Schengen B gates is much better, to be honest. It's got a classier vibe, a fully tendered bar (with a very wide range) and tends not to be as busy. If you're departing from one of the further A gates (A30+) you're better off going to the slightly smaller business lounge in the terminal pier - less chance of missing a flight walking the length of one of the longest airport piers in the world. Having flown through Frankfurt 300 times in the last few years, I've got a fair idea of the lounge layout! Stand up conversation booths, that's very retro. Comment on "Lufthansa Senator Lounge A50 (Schengen), Frankfurt Airport"